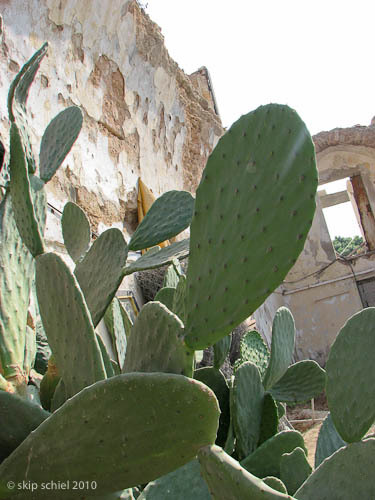 Prelude, a dream: I was alone trying to leave from some spot where I was imprisoned. A police officer watched me to assure compliance with the restriction. He fell asleep but I knew he’d awaken suddenly if I went off alone. A woman appeared, a savior figure, who was in a similar situation. She suggested we walk off together and then the officer wouldn’t notice I’d fled, assuming I was solo. We did this and succeeded. Is this not a metaphor for my quest? What could be clearer? It is so obvious as to be suspicious. Just a few minutes ago I succeeded—solo—in uploading and announcing my first photo set from this trip, along the coast, Jaffa and Tel Aviv. Do they effectively use and show Mediterranean light? I’m not so sure. The sunset ones might, the water ones seem not to. They are subtle. From the building photos, how many people will read my meaning about the insidious Israeli takeover of a traditional Arab region? They make use of serendipity. The juxtaposition of the sleeping, presumed homeless man and the vibrant striding woman. 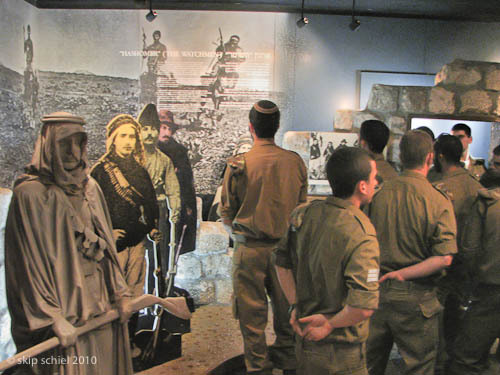 The pairing of the old time cutout soldiers and the newly born soldiers at the Haganah Museum. Just finding the museum was providential. I was not searching for it. 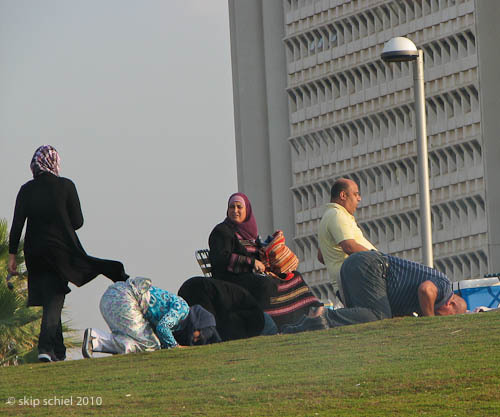 Happening to be along the coast during the Muslim holiday of Eid Al Adha, or Festival of Sacrifice, first noticing smoke in the distance, then charcoal burners, then smelling cooking meat, then Palestinians, the Palestinians celebrating Eid, I gradually experienced a dawning, an awakening. I phoned Amal [director of the Quaker Palestine Youth Program I’ll be working with] at this point to announce my pending arrival in Gaza. Where are you? she said with some nervousness in her voice. I am worried about you. Apologizing, but suggesting I’d sent her an email about my successful entry into Israel, I told her where I was and what I was doing, quickly adding, I’m sure the same is happening where you are. I wished not to make her jealous by situating myself in the relatively free zone of Jaffa while she is imprisoned in Gaza. 50 miles south. An entirely different picture, entirely the same. I titled the main series, Along the Mediterranean Coast, and intend to continue the comparisons. I’ve subtitled this set Sauntering 40 miles north of Gaza, hoping to make the point of difference, but not too dramatically or obviously. So yesterday was devoted to a strolling discovery. After consulting maps and my guidebook I headed north, toward downtown Tel Aviv, not sure where I was going, certainly not sure what I’d find. 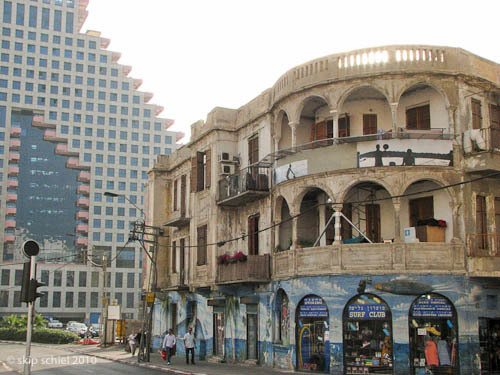 First, Neve Tzedek,a small shop-artist district filled with Arabic architecture. Then a main road, Rothschild Boulevard, thinking of the benefactor and also Alice Rothschild, activist and physician, neighbor and friend, colleague and organizer, author and video maker. Here I encountered the Haganah Museum, altho I’d hoped to visit the Palmach Museum, which I learned eventually was very far north, out of range by foot. A well organized and run museum, small-scale, not with huge funding, relatively old, visited on my day mostly by army soldiers and middle school age children, very few visitors like me, the Haganah Museum’s 3 floors depicted the history of this nearly 100-year-old institution. Haganah was a combined liberation-resistance organization, using military means. It helped liberate the nation from the British and Arabs and it resisted Arab and British influences. It began as a defensive organization, defending early settlements and kibbutzim, then discovered that the best defense was a strong offence. I learned the Palmach, to which my friend Beny Gefen once illustriously belonged, was an outgrowth of Haganah, known as The Shock Troops—daring raids, big risks, the elite and vanguard of the military movement. All such streams fed eventually into the IDF (Israeli Defense Force), or OPF (Occupation of Palestine Force), or army. I can understand why new solders and young children are brought to this museum. A missed photo: stacks of M16s across the room from kids’ backpacks. Couldn’t quite get the angle right. Further along Rothschild which truly is a boulevard, landscaped down the center with palms and benches, a few coffee shops. Stop for espresso in one, and fresh squeezed orange juice (the famed and appropriated Jaffa orange?). Earlier I’d eaten a late lunch at a small café called something like chiki liti. Few spoke English. Not only was the food good and relatively cheap (chicken sandwich with traditional Israeli salad for 35 sh) but the customers and staff were indeed almost universally handsome. Rothschild seems to end at a newly constructed, not yet opened auditorium complex. So I headed west toward the sea. Another boulevard, and soon the Mediterranean, an easy walk on a relatively cool day. Then along the main roads bordering the sea, hoping for a tower which might provide a high vantage point for my camera. Finding none, learning that the Shalom Center had recently suffered fire in its 2 top floors, forcing closure of the observation deck (reserved for another trip), I went directly to the sea. Incidentally, the man telling me about the fire, an attendant at the American Embassy (now I know where that possibly much needed office is) joked with me by saying, the Shalom tower was bombed. At the sea, reclining along a ramp, I noticed a black man. I’ll photograph him, I thought to myself, using the Lou Jones technique, moving in respectfully, observing body language, stopping if the language or mouth said no. He said no. He asked me to join him. From Ethiopia, possibly drunk or high, he told me he has business, what business was unclear. He told me he loves Israel. He told me I would have to pay him much money if I wanted to photograph him. Declaring that I usually do not pay when I make photos, understanding his retort that I might earn money with his photo—doubtful, I claimed, unless you’re famous—I offered him what he regarded as a pittance, 2 shekels, 5o cents. Make it 200 and I’ll say yes. No thanks. We shook hands, I departed for the promenade to see what I might find. The sea walk might be regarded as the third leg of my tripodic walk, the first being the old Arab neighborhood, second the Rothschild area, and the third then is the sea. And here I realized the special timing of Eid. And of course I noticed and tried to show the peaceful intermingling of the various populations, mainly Israeli Jew and Israeli Arab or Palestine, with a slight infusion of tourists like myself. A model for the future perhaps? The light was fading, further perfect timing. I’d been walking since about 10 AM, thru full sun, and now into dimming sun and rising moon. It is about high moon time, full moon, and with it Moon Momma, my recollection of my mother, always a special time. Not tired, and not wishing to return to the hostel too early, but early enough—to retrieve my gear stored in the office, and to pick up the whiskey Elena left for me to carry into Gaza to give to our mutual friend Mona—I walked past the clock tower area and down the road further into Old Jaffa. There I discovered, but could not find a way to photograph, more mixing of the populations. This time clusters of young Jews listening to lectures, and groups of Palestinian families returning to buses. An exhibit of Palestine art graced the cavernous space of an old warehouse. Would you like to move to the USA (I try to always use this term, rather than America)? Surely, but we can’t get a visa from your government. One had lived for a few years in the US, didn’t explain why he returned to Israel. 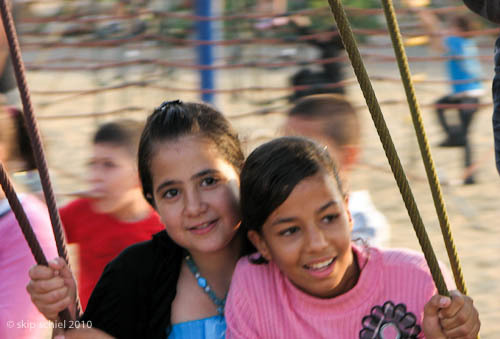 They complained about the stress all Israelis feel. From what? I asked. One said from money, the other from the fact of being surrounded by Arab Muslim people. Why money? Not paid enough. My job as store manager in your country would earn me something like $40,000 a year. Here much less. We’re paid in shekels and must pay in dollars. (Which I didn’t understand). They also complained about laziness among Israelis, leaving the hard jobs for Arabs. And they seemed to say also that many in the US are lazy, which I took to mean the blacks, maybe Muslims as well. I think I’ll save this morning’s story for tomorrow morning—how I got to Gaza, the surprising reception at the Erez Crossing. And now move along, finish unpacking—I’m showered, clothed in cleanery, smell and look good, snacked on an apple with peanut butter, coffee—and head out somewhere, preferably the beach once I’ve gotten the OK from Amal. With a stop for grub. The taxi driver, Ahmed, thought strolling alone would not be a good idea. No booze, unfortunately for the next 5 weeks. Yes, it’s all here, Skip. Your images truly speak. 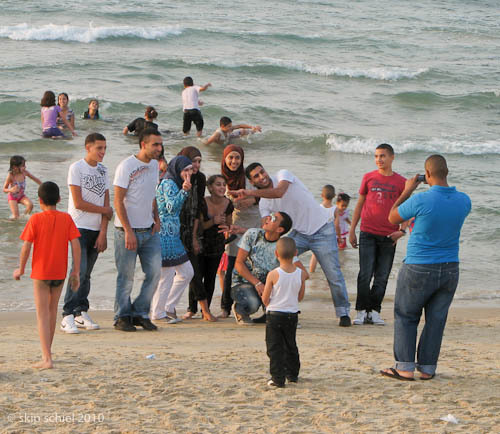 The myriad contrasts on the beach, the Eid celebrators so happy, so lively together, the soldiers in the museum, the images of the old city, the brilliance of the fading light over the sea. Each image speaks of the human condition, of barriers and the interweaving of us all. I was so touched by both the photos and the commentary. Your reference to your mother is especially touching to me. My mother died in 1970, when I was 20, just weeks after I returned from my trip to Israel. Time dulls the pain of loss, but there is so much I wish I could discuss with her. Never had the chance to tell her about the Bahai religion I learned about when my “Jewish” tour went to Haifa and the magnificent Bahai gardens. That was when the seed of my conversion was planted (it was a very slow-growning plant…I didn’t adopt the religion until 2002). Never had the chance to explain to her that I felt more at home in Arab neighborhoods, shops, cafes, than I did in the Jewish ones. So many thngs never discussed, but I cling to the thought that somehow she knows. Your photos are wonderful and the intent is clear. 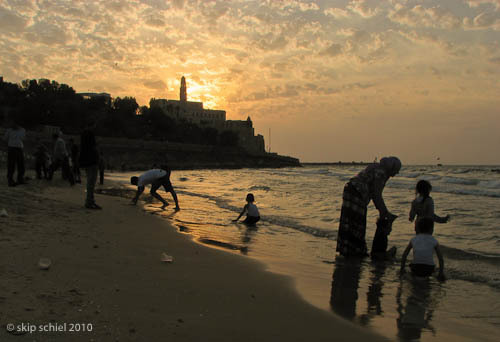 I love the ones of Palestinians along the sea…there is at least a sense of freedom and endless possibility. thanks for the affirmation. i’m never sure how much i am expressing, or how much to express. i remember well the suggestion of jerry berndt, a photographer friend: skip, challenge your audience more. do not be so explicit. thanks so much for your comment, esp your reference to your mother. grief can lead one down surprising paths. my mother appears to me in the full moon, every month. we are in touch. distance or region is immaterial. it happens on the great plains of the usa, on cranes beach near gloucester massachusetts (where i first discovered the connection decades ago), and in jaffa or gaza along the beach. So glad to see the beginnings of your journey. Have a safe and productive time.